Ruth Singer for Enamore launches! I’m really pleased to announce this exciting new venture. 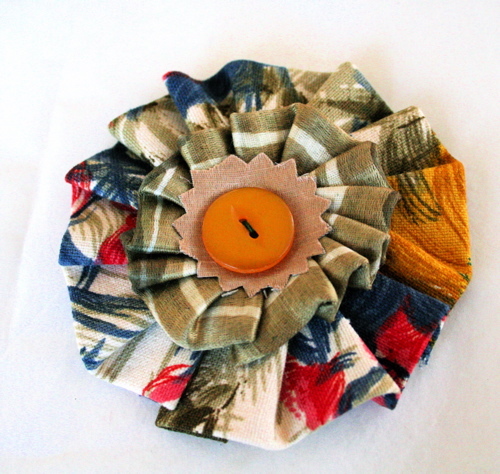 I have designed a range of corsages for Enamore – a fashion label working in organic and sustainable fabrics. More about the collaboration here. This is one of the samples – the final choices will be up on Enamore’s website in a few days and the collection will be launched at London Fashion Week in February. This is one of the many things that has been keeping me very busy indeed over the last few weeks and I’m really excited to see it go live. I’ll tell you more about how this all came about soon….I’m rushing around the country at the moment – three days a week at Bilston and one in London, and a LOT of time travelling. I’m not getting much time at home to catch up on other work, let alone blogging. I’m back off to Bilston in a matter of hours to run a soft-toy making workshop for kids. Wow, how exciting. I would love to work with someone like that. I need to try and be like you! Did it all happen through Origin?Sorry I didn’t get to see you in person at Origin, but loved your work. Good luck! It didn’t come through Origin, but through a tiny article about me in a local magazine which Jenny at Enamore read, and then I happened to contact her a few weeks later, and it grew from there. Hope I’ll be at Origin again this year and meet you then! Congrats Ruth! I’m so pleased this did come about – I remember talking about this when we last got together. I am an 18 year old student and i am designing a similar corsage to what you make.I have already made a mock up and the total cost was under £1. If you are using recycled materials-then why the extremely high asking price?I do not see the logic.Recycling items are meant to be cheap!